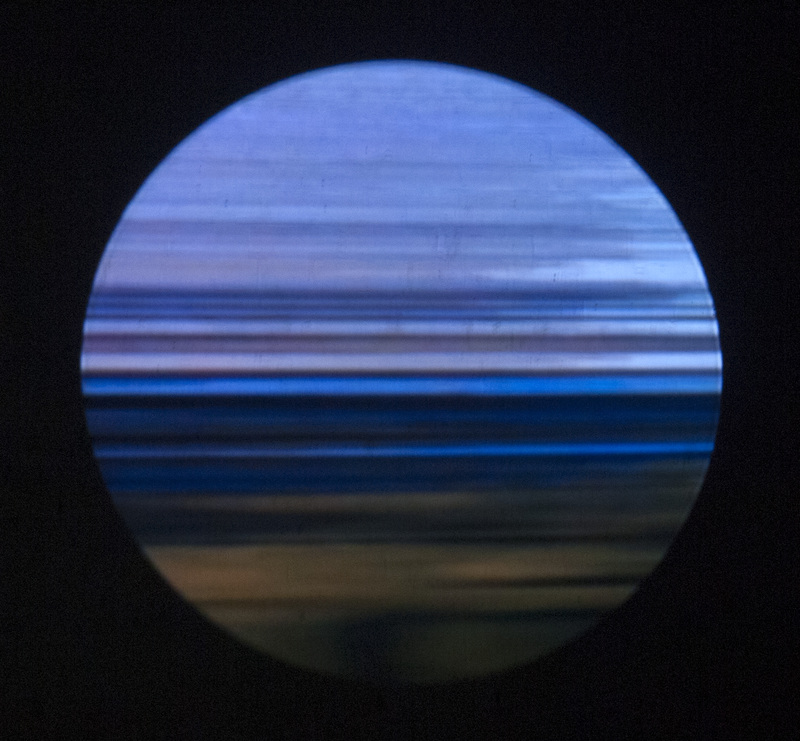 Gareth Polmeer: New work at Screenscapes, programmed by Collective-iz at Apiary Studios, Hackney Road, London, March 28th, 2014. For some time Gareth Polmeer has been making short loop pieces by re-working original video footage, usually of land and seascape. His working method takes advantage of some specific possibilities offered by digital video editing, and builds on a tradition of image manipulation beginning in the analogue / TV era, specifically that developed by Steina and Woody Vasulka from the early 1970s onward. In his experimental video work C Trend (1974), Woody Vasulka disrupted the stable image, shot from a window overlooking a street, by manipulating the vertical and horizontal timing parameters –the video ‘frame’- of the signal from the camera, leading to a kind of indexical image that is non-representational, but in which the image content –passing cars- can be inferred from the traffic noise on the soundtrack. The work makes explicit the fact that an iconic video image must be stabilized in temporal as much as spatial terms, indeed the spatial and temporal co-ordinates are effectively indistinguishable. 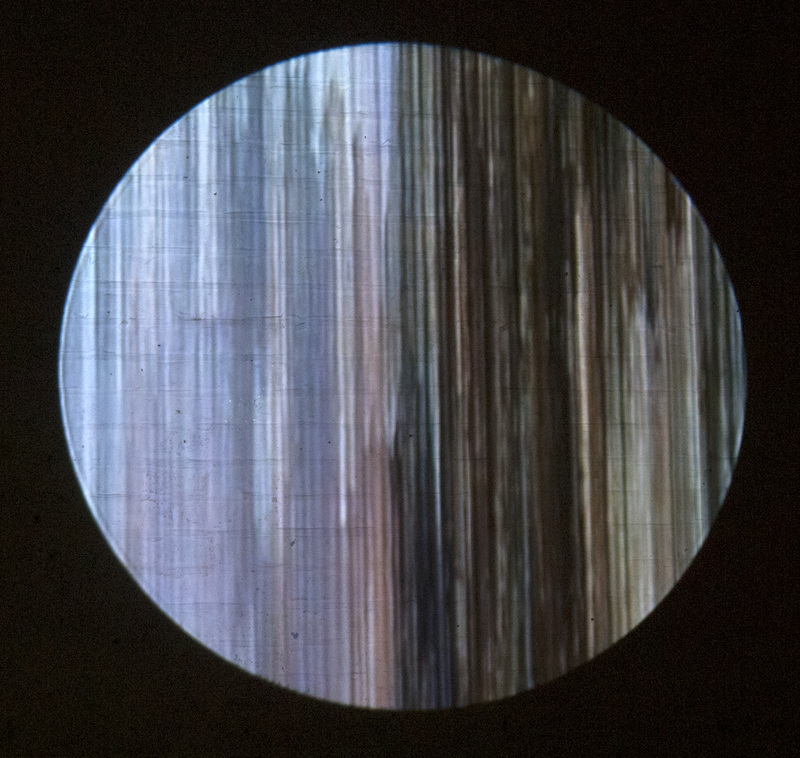 However, whereas much of Woody and Steina Vasulkas’ work has been made by manipulating voltages that control aspects of the camera signal in real time through the Rutt-Etra Scan Processor, Polmeer reconfigures his original footage in post-production, exploiting the possibilities for the minute reordering of the component lines of the image in digital editing, whereby he can isolate single rows of pixels so as to turn them into a non-iconic representation that is temporally multiple. But whereas C-Trend manipulates the timing control voltages of an image whose temporality itself remains unchanged, Polmeer’s work recombines single lines of image from different frames of an original sequence of several seconds or more. This method is underpinned and validated by the fact that the ‘Rolling’ shutter common to most modern camcorders (and cameras) exposes the light-sensitive sensors line by line from top to bottom, much like the mechanical shutter found on cine film cameras. Thus on a spatial/compositional level, the work is a kind of collage, in which an image is cut into very thin horizontal layers, which are reassembled into a different order. This same process also takes place in the temporal dimension, so that the lines from different moments in time are also displaced and repositioned. Spatial inversion and temporal reversal further remove the constituent lines from their original place and function, to create a mirror-formed loop, a mirror within a mirror. In a similar but different way to C-Trend, the work isolates and foregrounds the presentational form of the video image as compounded from lines. In cathode ray TVs, the image is scanned onto the screen in a series of left to right, top to bottom lines. In other words it is inherently linear. In modern flat screens and projectors, the pixels are always ‘on’, and their brightness is controlled by the rapid variation in the voltages applied to them, in order to change the composition of the image over time, ie to generate an apparently moving image. However, the composition of the image is still linear, and this is what Polmeer’s piece exploits. Like the images in C-Trend, the viewer still has the sense that they are looking at footage of something, and the composition still bears some kind of relationship to a landscape. It appears –seems- to have sky, water, perhaps grass. But whereas the soundtrack in C-Trend proffers a didactic address, by which the viewer can find a way into the image and begin to understand, in a non-technical sense, what is going on, Polmeer’s piece turns more on the incipient abstractness of all images, but crucially extending this into an effect of temporal manipulation proper to time based images.